July 11, 2016 /0 Comments/in Pregnancy /by Reiter & Walsh, P.C. This week, Grand Rapids’ Spectrum Health Family Birthplace became the first medical facility in Michigan to adopt the Clever Medical C-section drape, a device invented to allow mothers delivering via C-section the opportunity to bond with their babies immediately after delivery. The Family Birthplace, which is located within Butterworth Hospital, is one of the first medical facilities in the United States to use the Clever Medical C-section drape. Unlike mothers delivering vaginally, skin-to-skin contact between the mother and baby is often delayed for mothers undergoing Cesarean section operations. After babies are delivered in a standard C-section operation, medical personnel move them to the baby warmer while the physician completes surgery on the mother. 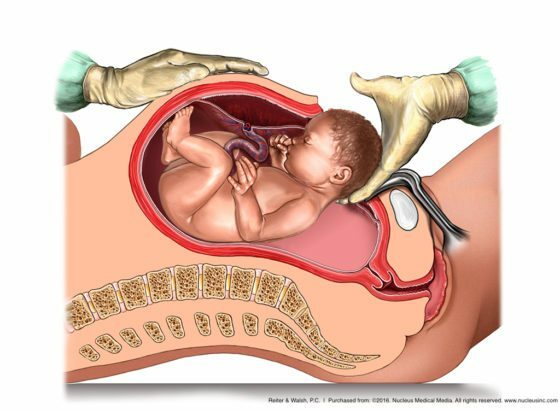 The Clever Medical C-section drape allows the physician to hand the newly delivered baby through an opening in the drape to directly to the mother, immediately following birth. The opening in the drape protects the sterile field around the C-section incision, shielding both mother and baby from exposure to injury. FAQs: Can a Delayed C-Section Cause Cerebral Palsy? FAQs: What Is a C-Section? When Are C-Sections Performed?